So begins the mythic Telling of Shamanic Creation, when we Two-Leggeds (humans) were one of the Animal Brothers, in the place of our Origin. The story goes on to tell of how the Two-Leggeds left the Circle of Animal Brothers, left the embrace of Grandfather Fire, and went into the Darkness and into the land of Death that we humans refer to as Life. In this place of Death, we lost our ability to communicate in the Sacred Language of Spirit. So that we would not be lost forever, but always have a way of finding our way home, Grandfather Fire sent the Eagle to Grandmother Earth, and to those who are of her domain. This Eagle — Eagle Brother/First Shaman — brought to us Two-Leggeds “The Ways” — the compendium of knowledge, dances, songs, stories, methods, techniques, meditations, approaches to Spirit and ways of Power through which we could seek, find and fulfill our own unique Path of Reunification with Grandfather Fire, which is our path of self-realization. There came a time when Eagle Brother brought to us the Shamanic Drum. It is the Shaman’s foremost vehicle for engaging one’s attention in spiritual upliftment, for the gift of the drum is that it enables us to once again communicate in the Sacred Language of Spirit! 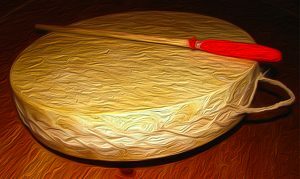 A thorough understanding of the phenomena associated with the experience of Shamanic Drumming must include an integration of both the physiological and the transcendent. A Shamanic Drum is constructed within very precise parameters for maximum effectiveness. The rim is made of wood, usually cedar, or a local wood with good resonate qualities. The coverings are most typically of elk or deer rawhide. A rim 3 to 4 inches in height by 17 or 18 inches in diameter provides the proper dimensional relationships for the qualities desired in a Shamanic Drum. When a drum of these materials and dimensions is played, it offers qualities of tone unlike any other drum, even the one-sided hand drum that many people nowadays are using. When a Shamanic Drum is struck upon one side, it produces the sound of the beat, and a primary tone, or resonance. Since the hides covering the two sides of the drum are never able to be strung to precisely the same tautness, one side will always have a slightly higher pitch than the other side. The primary tone on the higher-pitched side will, consequently, have a “ring” to it. When the lower-pitched side is struck, a lower “drone” is produced in addition to the beat. Because of the close proximity of the hides to each other, being only 3 to 4 inches apart, when one side of the drum is struck, the sound wave of that strike impacts the other side’s hide, causing it to resonate as well. We now have three tones being produced simultaneously form one strike: the beat, the primary tone (either a “ring” or a “drone,” depending on which side is struck) and the secondary resonance of the opposing hide’s vibration. The human mind fixates upon the monotonous and repetitive. The constant striking of the drum produces a repetitive and monotonous beat pattern. When the mind fixates, all “chitter-chatter” and emotional overwhelm ceases. A profound state of Silence ensues. The high-pitched overtone stimulates the brain into the alpha brain wave state. This alpha state is experienced as a dreamy, daydream-like state of being. Physiologically, our response to the alpha state is a deep physical relaxation which comes over us. A daydream’s content is driven by the emotionally laden internal dialogue going on within us. Because the mind is fixated, there is nothing to drive any content. In this way, Shamanic Drumming produces a daydream state of alpha without emotional content. The undertone “drone” produced in Shamanic Drumming stimulates the brain into the theta brain wave state. Though this is characterized as the deep dreaming state, the most relevant response is that the drone opens our spiritual heart, allowing our indwelling presence of being, our Spirit, to rise forth unimpeded. When these three states of consciousness — silence, alpha and theta — occur simultaneously, as in Shamanic Drumming, a phenomenal experience proceeds. The Spirit, rising forth through the now opened heart, is freed to express itself. The Spirit expresses itself through image, symbols, song/chant, tones, colors, sensations and knowingness. Where does the Spirit express itself? In the now empty alpha daydream state. The mind, fixated and silent, cannot help but pay attention to that which is transpiring within the alpha state. We are now able to perceive directly the expressions, or desires, of our Spirit — that is, we are now able to once again communicate in the Sacred Language of Spirit! What had become lost to us, due to the spiritual amnesia inherent within incarnation in the mundane world, is now directly accessible to us once again — through the direct experience of Shamanic Drumming!